An icebreaker travels through the Beaufort Sea. Not even ongoing litigation can stop President Trump from pushing forward with his pro-fossil fuel agenda. The Ocean Energy Management Bureau (BOEM) announced Thursday the launch of the public comment period for a proposed oil and gas lease sale covering more than 65 million acres of the Beaufort Sea along Alaska’s northern coast. The bureau formalized this by publishing a notice to the Federal Register Friday. This move comes despite an ongoing legal challenge brought by environmental groups, including the Natural Resources Defense Council (NRDC) and Center for Biological Diversity. These groups argue Trump failed to consider climate change and the region’s sensitive marine resources when he signed an executive order in April 2017 to reverse a ban on Arctic drilling passed by former President Obama. The lawsuit also raises constitutional questions about the president’s ability to throw out the permanent drilling ban Obama set forth under the Outer Continental Shelf Lands Act, something that has never been done. The plaintiffs presented their oral arguments in court last week. The case could readily last another year or two if any party appeals the district court judge’s decision. And if Trump’s executive order reversing the Obama-era drilling ban is found illegal, that means so is this lease sale. However, BOEM spokesperson John Callahan told InsideClimate News that there’s nothing illegal about the government beginning to plan amid the lawsuit. Obama banned drilling across a huge swath of Arctic waters in late 2016 to prevent spills and subsequent environmental disaster. These waters are home to whales, walruses, and polar bears that are already at risk from habitat loss and degradation thanks to climate change. Alaska Natives also depend on these waters and their wildlife to sustain them. An oil spill not only has the potential to devastate the ecosystem, it could threaten the lives and health of the people who depend on it. The Trump administration doesn’t appear to care. In January, the Department of Interior proposed its National Outer Continental Shelf Oil and Gas Leasing Program, which opened up nearly all of U.S. waters to drilling. 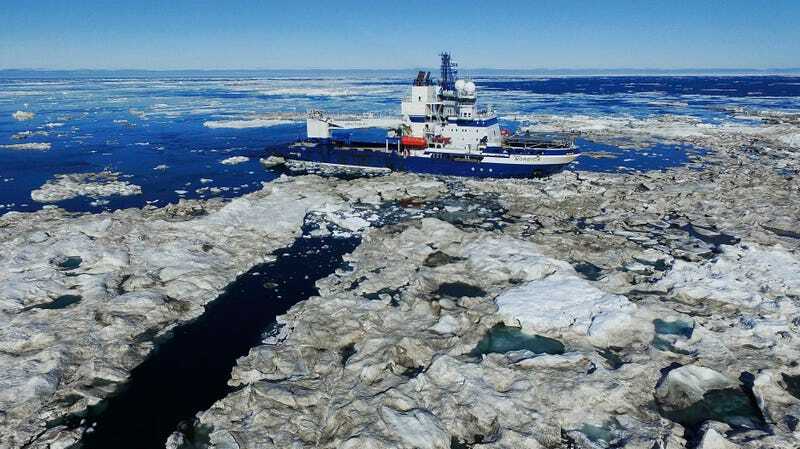 The 2019 Beaufort Sea Lease Sale is just one piece of that greater proposal. The program proposes two more sales in this sea, one in 2021 and another in 2023. BOEM noted it’ll also begin preparing the environmental impact statement (EIS) for the sale, and it will hold public meetings in Alaska through the month of December. The bureau wants to hear about alternative areas where Alaska Natives can continue their subsistence whaling practices “to minimize conflicts,” per the notice. The public has until December 17 to submit any comments on the 2019 Beaufort Sea Lease Sale. The EIS will mention “potential effects of leasing, exploration, development, and production of oil and natural gas” in these waters, according to the federal notice. It’ll also explore alternatives to the sale, including a “no action alternative” where the sales don’t happen. That’s ultimately what opponents want to see happen. Trump-approved oil and gas operations in the Arctic are already facing a bit of trouble: The Liberty Project, also set to be in the Beaufort Sea, is suffering a delay due, ironically, to a lack of sea ice. It’d be the first oil and gas production facility in federal Arctic waters, but that’s only if it can figure how to work around this sea ice loss. The original plan was for Hilcorp, the Texas-based oil company behind the project, to build a gravel island during the winter near the shore to drill. The company first planned on driving out across coastal sea ice to build that temporary island back in 2015. As Alaska Public Media recently reported, the company has run into delays because the sea ice is now forming later and doesn’t stick around as long as it used to. The Beaufort Sea saw especially high temperatures and near-record low sea ice this October, according to the National Snow and Ice Data Center. Just this week, the northern Alaskan community of Utqiaġvik, which straddles the Beaufort and Chukchi seas, saw its sea ice begin to form, something that should’ve happened weeks ago. “The degree of change … has been so remarkably rapid that communities are pretty much struggling to adapt,” said Olivia Lee, a research assistant professor at the International Arctic Research Center at the University of Alaska at Fairbanks, to Earther. For now, we can thank this sea ice loss for delaying the Liberty Project, but it’s really nothing to celebrate. It’s messing with where people can hunt and how they live. And the oil industry is ultimately to blame for that. The Trump administration, however, seems determined to push forward with more drilling—with or without sea ice.